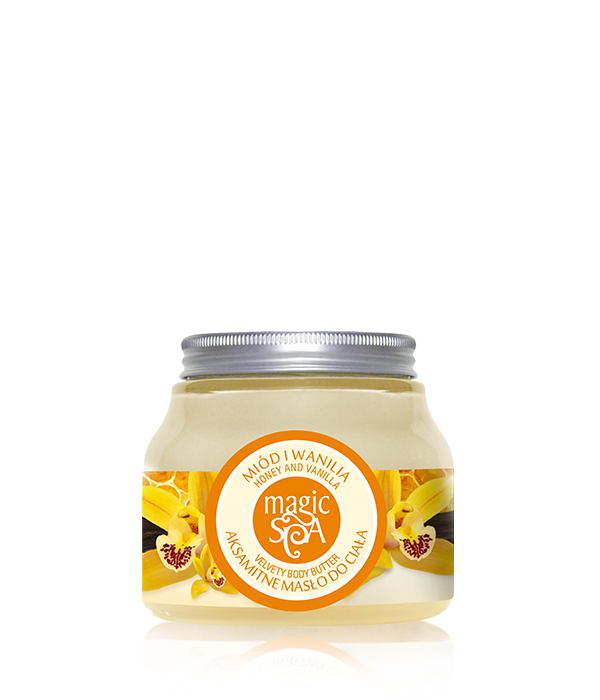 Magic SPA Honey & Vanilla soothing body butter with vanilla, carite butter and canola oil. Its velvet texture caresses the body, soothes the senses with warm tones of orange flower and seductive vanilla. It regenerates, deeply nourishes and gently oils. It protects the skin from moisture loss, instantly eliminates the feeling of tightening and dryness. The body becomes wonderfully soft, comfortably moisturized and naturally sensual. Perfect for dry and normal skin. Vanilla, carite butter and canola oil. Aqua, Butyrospermum parkii, Isopropyl myristate, Glycerin, Cetearyl alcohol, Ceteareth-20, Canola oil, Vanilla, Cera alba, Cyclomethicone, Cetyl alcohol, Glyceryl stearate, Phenoxyethanol parfum, Citrus aurantium floris methylparaben, Butylparaben, Ethylparaben, Propylparaben, Limonene, Acrylates c10-c30 alkyl acrylate crosspolymer, Disodium edta, Hexyl cinnamal, Coumarin sodium hydroxide, BHA, Anise, Alcohol, Linalool, CI 19140, CI 16255.